Your final time is 01:37:22 at a 00:07:26 pace. You finished 61 out of 1241 in the HALF MARATHON. You finished 6 out of 67 in your class M40-44. 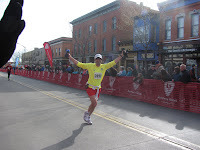 My cousin Jen took this awesome photo just before I crossed the finish line.